The recently completed Clyde Mews is an environmentally focused community comprising six family-centric townhouses and two apartments. Designed by Six Degrees Architects for Excelon Group the project sets a new benchmark for inner city, medium density development. Located at 80 Clyde Street in Thornbury, the project is at the forefront of sustainable design and construction, with Excelon and its design team working alongside the independent Moreland Energy Foundation Limited (MEFL) to improve its sustainability credentials and minimize waste where possible. The development repurposes materials from the previous dwellings which occupied the site, complemented by recycled timber, and locally sourced recycled bricks which were carefully selected. Each residence is equipped with energy and water efficient V-ZUG or Miele appliances, and living areas carpeted with durable 100% New Zealand wool carpet from Cavalier Bremworth. Designed to foster a car-free lifestyle, Clyde Mews is located in close proximity to public transport, walking and cycling tracks, and within walking distance to local eateries, cafes, and boutiques, as well as amenity such as hospitals, childcare, playgrounds, markets, and sporting facilities. 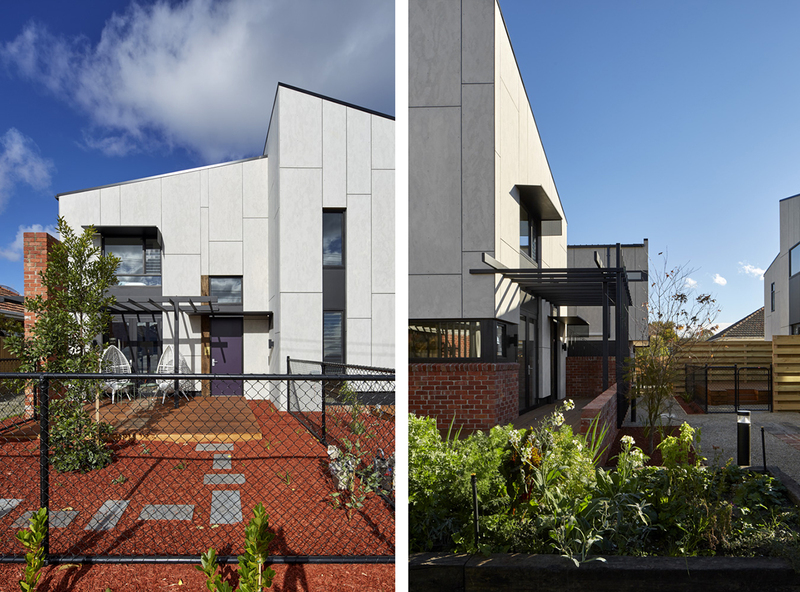 The project is a development of two traditional Thornbury housing blocks into medium density housing, and provides an alternative model to the usual car centric development of this type. Instead a model of medium density living is delivered that that prioritises the development of community, shared amenity, sustainability and landscape. The dwellings have been designed to maximise the site's orientation to provide energy and water efficient residences that are sustainable, comfortable and affordable. The project is designed to allow residents to live easily without a car and each dwelling includes two wall mounted bike racks, however at least one on-site car space is offered per dwelling. Car spaces are situated around the perimeter of the project to maximize internal space within the site for pedestrian access and public and private open space positioned around a a central shared space. 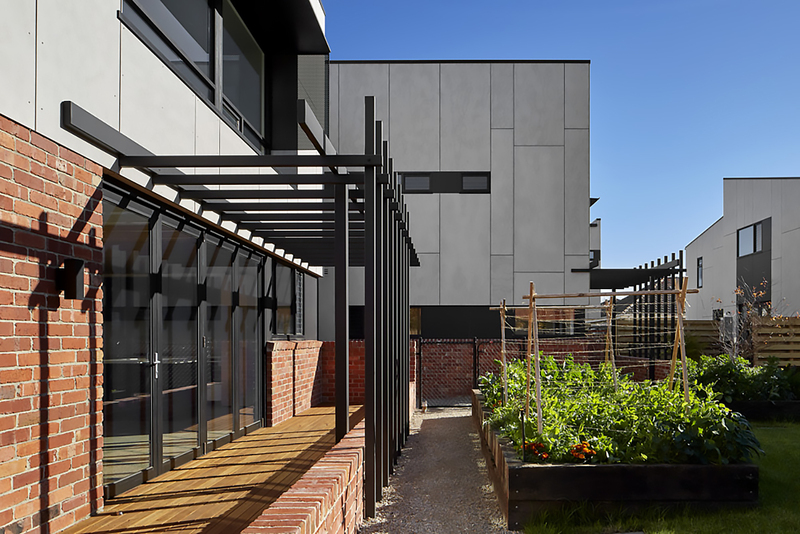 The communal garden has been designed to act as a shared backyard that contains seating and large planter boxes for communal gardening, including fresh fruit and vegetables for residents to enjoy. Extensive pergolas provide the framework for vines to form a lush canopy that will provide shade in summer, and will lose its leaves in winter allowing sun through to each residence. Water efficiencies at Clyde Mews include a 30,000 litre underground water tank for toilet flushing and laundry. Other sustainable amenities include solar power, and passive heating and cooling systems have been incorporated throughout the design as well as the building oriented to maximize natural light with north-facing windows, and awnings in the living and dining areas to reduce heat gain from summer sun exposure. Excelon are excited to have completed Clyde Mews, a project with incredibly strong sustainability credentials. We are committed to the Melbourne market and look forward to working alongside our industry friends to create a strong portfolio of sustainable, community-driven projects. We were thrilled to be involved with Clyde Mews. The project was conceived and designed to encourage a sense of community, and offer a new model for sustainable medium density housing. It’s a project at the vanguard of modern sustainable living in Melbourne.